On the 21st of November I went to Huntingdon where a a meeting of Cambridgeshire’s Shadow Police and Crime Panel was scheduled to take place. A meeting paper gave the “title/purpose” of the meeting as “Meet the Commissioner”. The meeting was listed online as being “private”, however in my view it met the legal definition of a local government “joint committee” and therefore ought, by law, have been open to the public (more). This view has been supported by the Centre for Public Scrutiny. I was prepared to observe, report on, and if permitted film the meeting. I think the first meeting between the panel and the Police and Crime Commissioner is highly significant and likely to set the tone for their relationship over the commissioner’s term of office. I would have liked to have heard, for example, what the Commissioner wanted the panel to do to support him in his role, what information the commissioner will be making available to the panel. I would have also been interested to hear the panel let the commissioner know what views they have come to in relation to their role, and the approach they want to take, during the series of “shadow” meetings they have been holding. In Sussex the first meeting between the Police and Crime Panel and Police and Crime Commissioner there is to be broadcast live on the internet and made available online for six months (See Press Release). This is dramatically at odds with what has been seen in Cambridgeshire. I arrived at the Huntingdonshire District Council offices more than half an hour before the scheduled start of the meeting. I made a video outside describing why I was there and I what I intended to do; I also shared these plans with Cambridge City Council leader Cllr Bick when he arrived. When I approached the reception desk to ask if I could observe the meeting they told me they had been told it was a private meeting. I explained why I thought it ought be open to the public (as a decision making joint committee) and they offered to call someone to come and talk to me. I spoke to a number of officers, a number of whom appeared to be supportive of my efforts to find out what was going on in the meeting, and what the commissioner was saying. One officer confirmed to me the Commissioner, Graham Bright, was present. Eventually, well after the 13.00 scheduled start time of the meeting, Alex Daynes of Peterborough City Council came to see me in the reception area saying he was one of those responsible for administering the panel. I explained I wanted to observe the meeting, and why I thought it ought, by law be open to the public. Mr Daynes said he would let the panel’s chair know I was present and the basis of my request to observe the meeting. I was informed that Commissioner Bright had left the meeting, to “return to Police Headquarters” and one officer even suggested I go there and ask him about his attendance at the panel’s private meeting. I waited in the reception area for over an hour, before deciding to go elsewhere having given my mobile number to the receptionists in case there was any progress. I went out to walk around the building where the meeting was taking place and generally look around. @RTaylorUK Once again you have your facts wrong. Cllr McGuire explained he was concerned that I was saying Police and Crime Commissioner Graham Bright had attended the meeting of the panel. McGuire told me that the Commissioner had been present to meet members of the panel, but had not stayed for the formal element of the meeting where they considered the items on their agenda. I gained the impression Cllr McGuire and officers supporting the panel thought it would be wrong if the Commissioner was present for the panel’s discussions on things like how to carry our confirmation hearings. They might well have a point, however the Chief Executive of the Police Authority, who will become a member of the Commissioner’s staff and is highly likely to be appointed as Chief of Staff, and therefore subject to a confirmation hearing, herself was present at the panel meeting. So if there was a conflict of interest with the Commissioner being present, there would also certainly be one with the presence of the Chief Executive. My view that how much of, and which elements of, the meeting the commissioner was present for is rather academic and a distraction from the key matter, that he was there, meeting members of the panel, in secret session. To try and pin down what happened I asked Cllr McGuire at what time the informal meet and greet with the commissioner happened. The reason I asked this is that I saw panel members arriving for the meeting, and most arrived within the last 5-10 minutes before the scheduled 13.00 start time of the meeting. Cllr McGuire refused to answer that question; he also refused to tell me if Cllr Bick of Cambridge City Council had arrived in time to meet the Commissioner. I did not see Commissioner Bright despite keeping an eye on those coming and going, and seeing all those approaching the reception desk, and many of those coming and going from the building containing the meeting for over half an hour before the meeting, to around an hour after it was scheduled to start. I don’t know if he was smuggled out of a back door so he didn’t have to face any questions from me. Meeting papers were made available online before the meeting however the papers for the item on the appointment of non-councillor volunteers was incomplete (due to interviews not having been carried out at the time of publication). The online papers were not updated when that information did become available, an FOI request might be required to obtain their release. No decision notices have been placed on the meeting’s webpage, meaning there is no official source of information on any decisions the panel made, or what the Commissioner said to the panel or what the panel said to the Commissioner. We are, apparently, all prima donna’s now. Days in from his election transparency,acountability and openness are forgotten. Thank you for your efforts – keep it up. The reason I got annoyed by this was that I get a little frustrated by Richard’s ability to put factual errors in his reporting. The agenda for the meeting was fully published and did not mention “meet the commissioner”. That event was an informal one that took place over sandwiches and was a chance just to say hi. Actually he dos not formally take up post until today. He was not present for any agenda item and nothing suggested or said that he would be. Richard has an important role to play and I admire him for what he tries to do. But if he is to hold people to account he needs to be as diligent about getting his facts right as he expects of those who he challenges. It is simply not good enough for him to say things in public that are inaccurate and rely on others to correct him – he needs to get things right first time more often. I still don’t think any factual error has been pointed to and the suggestion errors have been made are just vague attempts to discredit me. If any error is drawn to my attention I will of course openly and transparently correct it. As Police and Crime Panel member Cllr Curtis has noted the publicly available agenda did not mention the “meet the commissioner element”; this shows where the problem really is; there has been a lack of openness from the panel in being clear to the public what they were doing. I read all the material available online, and attended the venue of the meeting, made first hand observations, and spoke to a number of officers – I accurately reported live on Twitter and subsequently in the above article what I had been told, citing my sources. Cllr Nick Clarke has written an article saying he thinks people vote for the Conservative brand, so it is worth stressing 8 of the 13 panel members were Conservative and the panel has repeatedly voted to continue to operate in private following motions to open it up which were supported by other members as noted in the comment above. This might sound petty, but who bought the sandwiches? If paid for bythe public purse then the meeting with Sir Graham was a public one and not an informal one. I think it’s inappropriate for council officials and elected representatives to try and circumvent the rules by holding ‘informal’ meetings, irrespective of who paid for the sandwiches. Richard’s blog is an invaluable source of information, and the occasional factual errors occur mainly because so much information is deliberately withheld from him. If you’re a councillor, party member or public official reading this…… why do you think turnout is so low and people are so apathetic about politics? Busy people don’t always have time to go to meetings and take part in consultations. Please just engage with Richard so we can read his articles and find out what’s going on – you can always add a comment at the bottom if he’s got something wrong! Tend to dislike commenting on individual cases, but as Richard notes I’ve provided him with some advice on this matter, and I’ve shared some thoughts on this issue before. Firstly, PCPs – even those held before today – should be held in public. Home Office legal advice is that Part 5A of the 1972 Act has applied to such committee since their establishment (although legally they are not joint committees under the 1972 Act). Section 100E(3)(b) refers – this applies to “shadow panels”. I’m confident that the Home Office has no intention of taking any action against authorities who have not complied with this because a) until they made this position clear it was possible to take one of two different legal views on this matter and b) there is the argument that shadow PCPs are transacting business preparatory to their formal role. Of course, my view is that really such meetings should have been taking place in public throughout. Legally speaking the members of the Panel can of course meet “informally” before the meeting, and can be joined by the PCC – it’s a free country, after all (although see my point in the next paragraph). But it’s important that PCPs remember their formal role as a check and balance, and that they have been establish specifically so that these checks and balances can be exerted in a public forum. I can understand the practical value of an “informal” meeting but – as we’ve seen here – the perception can be created that such an approach isn’t wholly transparent. The Monitoring Officer at Peterborough will have consented to this approach in this instance but I imagine that, in the interests of consistency and transparency, and for the avoidance of any doubt in the future, the PCP may want to confirm that such informal meetings will no longer happen, this one having been a “one off” and no formal business having been transacted. So, the argument could be made that it was just a general chat over sandwiches with people milling around the room before the “meeting proper” got under way, the purpose being just to “get to know” the PCC – although this argument may be considered by some to be legally dubious. If it is proposed to hold more of these informal meetings in future, care will need to be taken. Where the people at the meeting will be the members of the PCP, there will be officers there and the meeting is taking place on council premises there is an argument that all such meetings would be de facto meetings of the PCP and as such subject to the 1972 Act in their entirety – particularly when they take place immediately before, or after, a PCP meeting. That’s interesting. I’ve not seen the Home Office legal advice and can’t find it online, but the suggestion appears to be that Section 100 of the Local Government Act 1972 applies, it provides for public access to “to any committee appointed by one or more local authorities….”. Section 100E (3)(b) refers to joint committees. I don’t follow why the comment above suggests this applies to shadow panels but also suggests they are not joint committees as defined by the act. I’m not sure it really matters. The Home Office legal advice has not, I think, been published, and I don’t have it in writing as it was given to me by a Home Office civil servant over the phone! Which I realise is not very helpful. They are not of the view that PCPs are local government joint committees under s100E(3)(a) (because the Policing Act says they are not) but they are under s100E(3)(b) suggests that the 1972 Act applies anyway. As far as I can ascertain that is the opinion of Government lawyers. The Regulations, published recently, can be seen as an opportunity to clarify a legal position that in many respects already existed. You would not believe the *many* long conversations I have had with people about this. As you say it really is about angels dancing on heads of pins – ultimately, the principle is that meetings should be public. I am not sure whether there is a specific part of any Act that suggests that the provision of sandwiches at a meeting disapplies Part VA but I am looking into it. 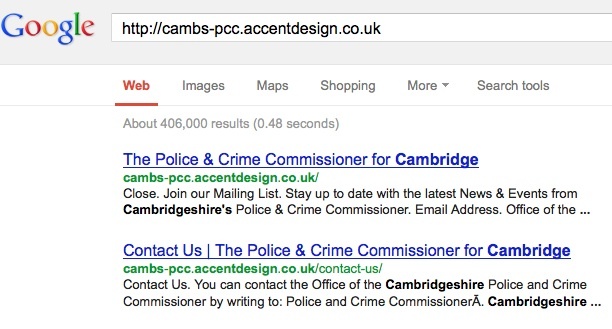 Why does this man only have pictures of Cambridge on his CPCC website – does the rest of the county not matter? Really has not made a good impression thus far what with refusing to work out of police hq and setting up shop in Cambourne, which is hardly central to the whole county. I wonder when he will be brave enough to spend some real time in Peterborough looking at the “priorities” there? Does he even know where it is, I wonder. Richard, seeing as though you are all in favour of openness and transparency there are three things I would like you to answer for me. What makes you an authority on police and public policy issues in Cambridgeshire? From what I can see you sell yourself as a reporter but are actually just an opinionated and slightly obsessive citizen. Why do you insist on calling Sir Graham “Mr Bright” in your posts? That’s not his name and its just rude – I don’t know how you expect him to engage with you if can’t even get his name correct. Is it not true that you attempted to stand as a candidate but were unable to get enough people to propose you? If that is the case then you are hardly the impartial person you make out to be. I think all the points are addressed already on this site, but I’m happy to go through them. I don’t claim to be an authority on police and public policy issues, nor do I sell myself as a reporter. I am no more a reporter because I sometimes report on events than I am a chef because I sometimes cook. I do though think that being a journalist or reporter is a description which can be applied to everyone who publishes newsworthy information and that to an increasing extent that is becoming a mainstream activity and not something restricted to a particular group. We see when newsworthy events happen those who are nearby are those who take photos and tell the world what’s happening using their phones, twitter, or whatever technology they have available. I think the way we run our society relies on people expressing their views and entering into public debate; I think it’s a positive thing to do to contribute to deliberations. As for not overdoing it with the “Sir” (I have I think on video called Mr Bright both “Commissioner” and “Sir”), this is to an extent intentional and related to my objection to an hereditary monarch ultimately governing the country in which I live. I am a supporter of representative democracy and the monarchy’s current position is in my view at odds with that. My understanding of knighthoods is that they are in the gift of the monarch. It’s not just Mr Bright’s name I drop the “Sir” from, I also generally try to drop from the “HM” from the Prison Service, Courts Service etc. On the last point. My standing position on becoming a candidate for an elected position is that I would stand if nominated. As someone who makes my views and ideas public sometimes people do express a wish to get my name on the ballot paper. When I expressed my views on what Cambridgeshire’s Police and Crime Commissioner should do a number of people offered to nominate me to stand, many of whom also offered to contribute to a deposit, however not enough people did this to create a valid nomination. My view is that we would have a stronger democracy if there was a greater focus on, and more publicity for, the opening of nominations, and more people thought about who they would like to see on the ballot paper. Currently the tiny fraction of the population who are members of political parties are those who are aware of nominations and take an interest in getting people on the ballot papers, I would like to see that opened up. The above comment from “Doug Roberts” was made via an IP address leading back to http://noisetor.net/. Using Tor to comment on my website suggests someone very keen to maintain their anonymity. It is good to see that Councillor Wilkins has brought to the attention of th Hunts Post the closed meetings of the Police and Crime Panel. Cambrisgeshire panel under the Chairmanship of Councillor MacGuire has from the outset taken a view that is in direct contradiction to legislation that meant to create a presumption of openness and transparency. In its place is the presumption that all should be done behind closed doors unless forced to do otherwise. Unfortunately due to the make-up of the panel Councillor MacGuire and his Conservative colleagues can treat this body as their own, and act with complete contempt of the electorate. How can we hold any of these people to democrtatic account if they always prefer to act behind closed doors, and fail to publish in a timely way the minutes of their meetings. The meeting of the panel on 21st November where two new members were co-opted have still not been published. Will they hide behind the fact that they were at this time a shadow body to not publish minutes.